Your stamina hearts display the amount of energy you use when working on your farm, fishing, mining, and other activities. You will start the game with five stamina hearts, but if you select the Sportsman personality type you will have six stamina hearts at the beginning of the game. As you complete work in the game, the number of hearts displayed will deplete until there are zero hearts left. Completely using all of your stamina will cause your farmer to pass out from exhaustion! Luckily Dr. Ford will rescue you if that happens, but you'll be stuck at his clinic for the rest of the day. Ideally, you do not want to pass out. When you have met the requirements to receive an additional stamina heart, Dessie will deliver the stamina boost to you when you exit your farm house in the morning. For the Sportsman or Weakling farmers, the additional stamina hearts will not be available once you hit the maximum limits. Likewise if you started a new game based on the Miracle personality type and you already have 10 stamina hearts, Dessie's event will still trigger but you won't gain any extra hearts beyond the maximum of 10. An easy way to restore your stamina is by eating food, especially cooked dishes. You can buy meals from the restaurant merchants in town or by making something using your kitchen. Typically the raw ingredients do not restore as much stamina as cooked dishes. You can also restore your stamina by using the Bathroom in your farm house (once you have upgraded its size) or sharing an afternoon meal with the villagers. Going to bed will also fully restore your stamina for the next day, but if you go to bed after midnight (00:00), you will wake up at 07:00 or later. Eating food from the restaurants and your kitchen may add status effects to your farmer, displayed as icons under your stamina hearts. The food effect will remain there for about two hours per ingredient used to craft the recipe. The icon will blink about 30 minutes before it expires to let you know it is fading. Once you have an effect enabled on your character, you typically must wait for it to naturally fade away. Any food that you haven't eaten yet that can trigger a status effect will have [?] boxes under the dish's image. After you eat the food, and if the food does have beneficial effects, the [?] boxes will become colored icons to represent the food's benefit. The amount of stamina you lose when using tools will be reduced by 20%. This effect is tied to a lot of rice recipes, but can be found in other categories too. If you wanted to speed up the passage of time, this effect will double the in-game clock speed. You can't have both Slow Mode and Fast Mode effects enabled; it will be one or the other. One in-game hour will take 30 real-time seconds. This effect is available on recipes that have a difficulty level of 7 or higher. Remember, the difficulty level is the level at which you can add toppings to a dish and not the level you need to be to successfully cook the recipe. 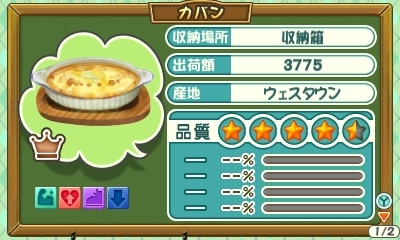 You can still cook a dish that has a higher difficulty level than your cooking skill rank. The fish will bite your fishing line as quickly as they do when you go fishing after midnight. This is great to have if you are participating in the Lulukoko Village fishing game festival. This effect is available on several pot recipes and some rice recipes. Giving gifts and talking to the villagers will earn you 20% more friendship. This will not affect negative value gifts (i.e., you can't lose 20% more friendship by giving crummy gifts). This effect is on a variety of recipes in all of the recipe categories. This effect will give you a 10% discount when buying supplies at the town stores, so it is handy if you need to buy construction materials such as Black Stone or Gold ore. This effect is available on soup and drink recipes. While this is active, you will slowly recover your stamina over time; about 1/2 stamina heart every 30 in-game minutes. This is common in bread/noodle recipes. This effect will increase the run speed of your character by 50%. Varoom! This effect is on salad and fried recipes. If you need more time in the day to do things, this effect will decrease the passage of time by 50%. One in-game hour will take 2 real-time minutes. This effect is available on recipes that require you to have a recipe difficulty level of 7 or higher.